To all who lived through the war years, and more particularly to those who saw active service—today has been a day of sacred memories, different perhaps in detail to each one of us, but yet all based on similar experiences and similar emotions. With the lapse of years, Armistice Day becomes naturally less demonstrative. The ranks of those who saw service grow yearly smaller, as we pay our toll to time. And in future the day will grow less weighted with meaning to the generation born in the years between. But whatever changes may come, and however slight may be the recognition of future generations, I hope that Armistice Day may never cease to be impressive. I hope that the two-minutes interval of solemn silence will always be more than a formal, statutory gesture—that it will always mean a reverent pause, in which we gladly remember, with tender and grateful thoughts, those who nobly died for our country’s ideals. Tonight, we who came home move back in memory 15 years to the hour when our army halted where it stood, when the firing died suddenly away on the Western Front, when the few last straggling shots echoed down the mightiest battle line the world had even seen, and were swallowed up in utter silence. We recall the silence of exhausted effort and of daring hope; we recall that still moment when, after four years of a strange life, in which death was ever-present, the fighting men were suddenly conscious of the fact that the strain was over and that they had now to adjust themselves to the new world of promised peace and justice and content, which they had been led to believe they were, after all, about to enter. But, like all other silences, there was a puzzled question in it by those fighting men. Was all the agony they had gone through for four years really to achieve its end? 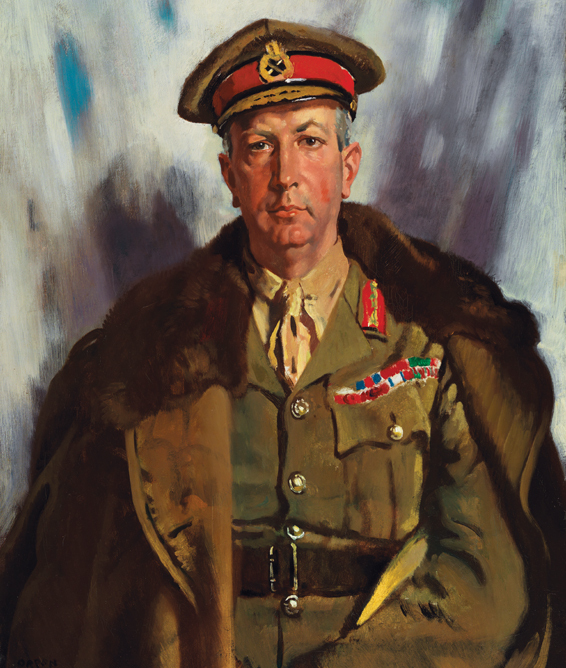 A portrait of Lieutenant-General Sir Arthur Currie was painted by Irish artist Sir William Orpen in February 1919. Today the pause, “The Silence,” was reverently repeated. But after 15 years of the promised new world we were told we fought to create, the puzzled question it tacitly conveyed is still unanswered. We remember tonight the high resolves of that time 15 years ago. There was unspeakable sorrow for the great army of youth that had gone so early to its death. We were told that the world would henceforth be safe for youth. But what of youth today, and the opportunity for youth in our modern world? Where, ask the men who fought, is that new world of justice and goodwill they suffered so keenly to create? Has the world done anything more in these 15 years than give lip service to the ideals for which our fallen comrades gave their lives? The answer to these questions is found in the actual conditions of the hour. And these conditions are such that Armistice Day should smite the conscience of the world. We are told in cabled dispatches this week that the international situation in Europe today is practically what it was in 1913 on the eve of the late war. And the rest of the world, like Europe, is haunted by the fear of war, a stalking fear, which for the past nine or ten months has dominated the press and private conversation. We are told that all that happened before 1914 is now being repeated; that behind the scenes secret agreements for a new balance of power are being made; that war propaganda is at work again; that sooner or later another war will wreck our civilization, and we will stand helpless amid the ruins. And all this is but 15 years after the signing of an armistice we thought was to end war—when we said “never again,” when the whole world said “never again,” as a pledge made by the living to the dead. That pledge is now but a faint echo, for old hates are reviving, old fears have come back, and on this 15th anniversary of a peace which was to silence battle fronts forever, peace is not a fact, but still a dream. We need, as never before, the healing qualities of devotion and fidelity and self-sacrifice and goodwill and comradeship and friendliness, so that suspicion may be vanquished and justice and mutual trust may be permanently enthroned. All this desire is in harmony with the real spirit of Armistice Day—the day dedicated to sacrifice and loyal remembrance of others. Armistice Day is primarily a commemoration of the dead. But a commemoration of the dead should be likewise an appeal to the living not to deplore the past, but to awaken our sense of responsibility to make our world less deplorable. We know from experience the stupidity of war, and the stupidity of those who made or caused wars. Does our responsibility end with condemning the follies of the stupid or the vicious 20 years ago? 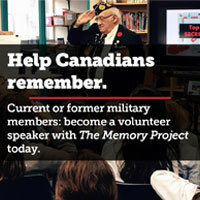 What can we do as veterans to make the world less deplorable? Are we fighting so that the next generation of youth will not condemn our stupidity as we condemned in the trenches the stupidity of our elders in 1914 and the era immediately before it? The truest commemoration of our honoured dead will be in the vigorous enlistment of our own lives and capacities in the struggle between unselfishness and greed, honesty and corruption, justice and injustice, and in the serious application to our national problems of those qualities which distinguished our Corps in the war days, and enabled us always to advance and conquer. 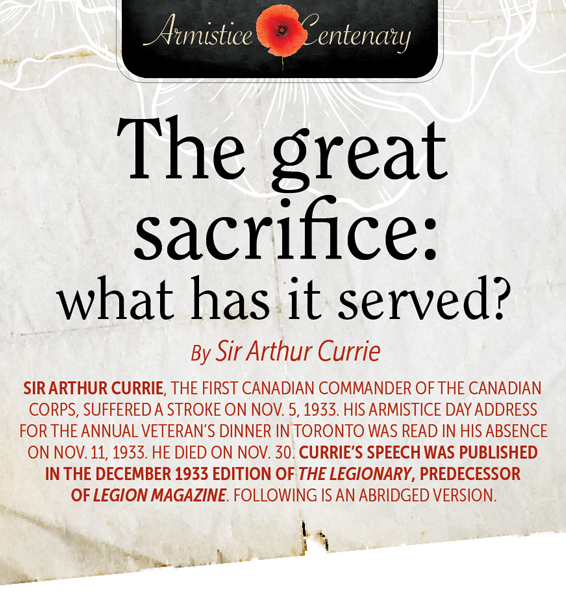 Armistice Day reminds our country of the steadfastness of our fighting troops. It should also be a reminder to every citizen that he still has a duty to discharge, if the war is to be fully won and its high objectives permanently secured. It should call us to a realization that we still have to complete the unfinished task of our dead comrades who speak to us tonight with a voiceless eloquence—the task of replacing the present system of suspicion and fear and conflict with the enduring fabric of confidence in humane law and order. And on this Armistice night, as we recall the nobility of your sacrifice, we turn away from trenches and wounds and death and we rededicate our lives with hope to the still unfinished work which you so gallantly advanced and for which you died. 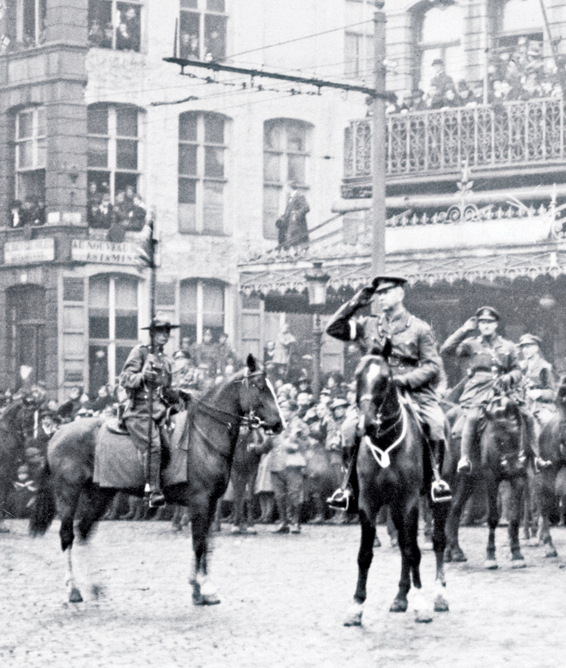 Currie, General Sir Frederick Loomis and other officers take the march past salute in the Grand Place of Mons on Nov. 11, 1918.